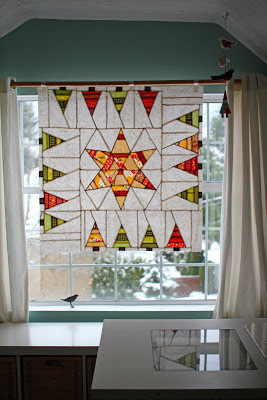 I sewed and quilted a few things for Christmas including this MugRug or mini quilt for the Vancouver Modern Quilt Guild Christmas scrap swap. 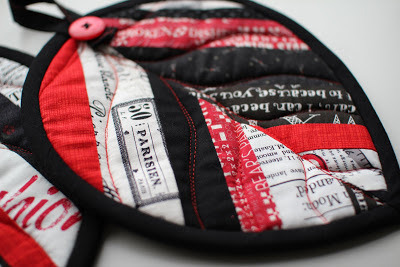 The challenge was to use a bag of scraps from a fellow guild member and create something they love. Upon finding the name of my partner inside the scraps, I headed to the world wide web in search of anything that could help me design something she would love. I based my design on a photo she had pinned of some scrapbook trees and then added a few of my own fabrics that would work well with the ones I received. I really liked how it turned out :o) Surprisingly my hubby liked it too and was sad to see it go! It was the first free-motion quilting done on my new Janome Horizon... Merry Christmas to me! I lucked out and found a gently used machine in box for a really good deal so it was a spur of the moment decision and I couldn't be happier. It's twice the size of my old machine and quilts like a dream. 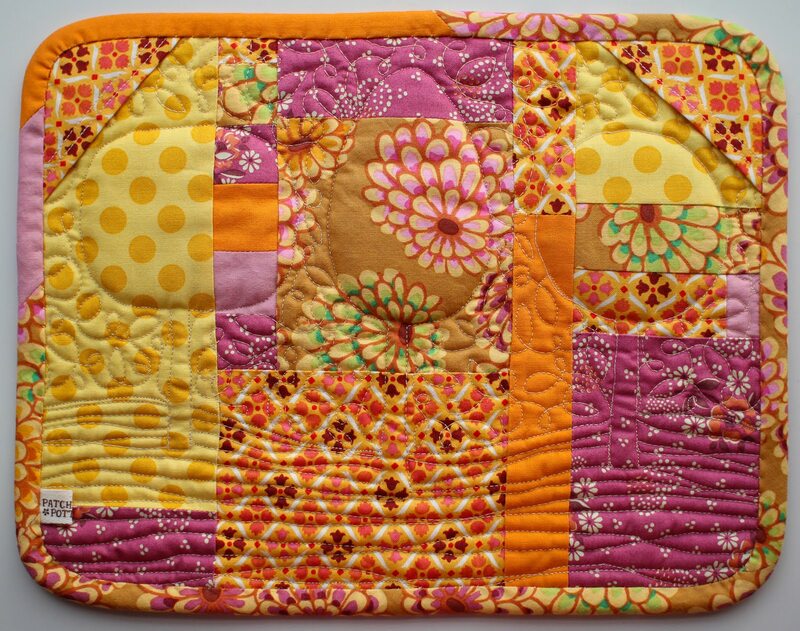 Although the item for the swap was supposed to be smallish, there were many larger items including this fabulous quilt top that I received from Paul. Thank you so much! I love it more than you could know!! You can see more fun items in our group photo. 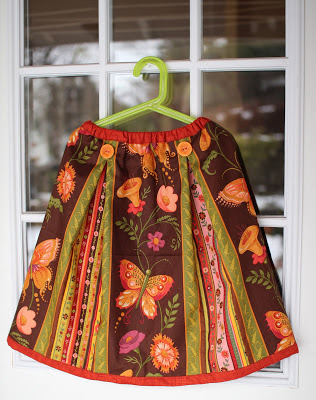 I also made my daughter three skirts. She loves heavily patterned clothes and definitely has her own style. Finding the perfect fabrics was just as much fun as sewing them! I hope you all had a wonderful Christmas and holiday season. 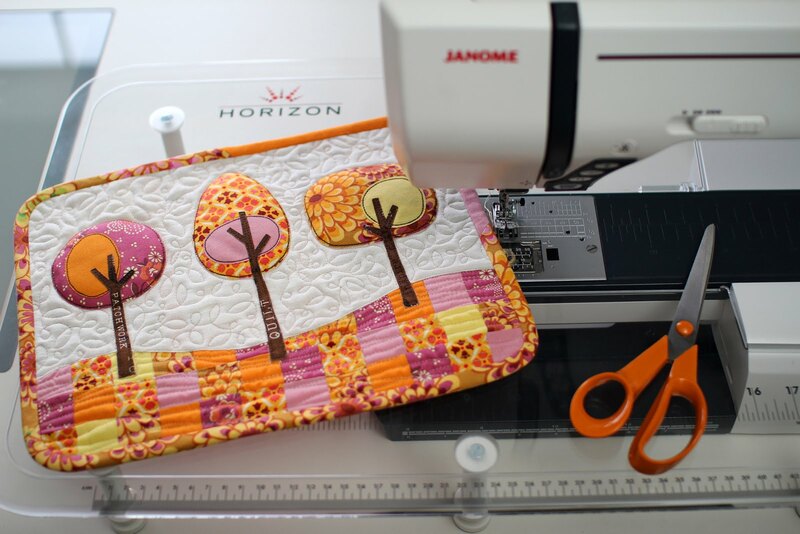 Happy Sewing in the New Year! Dear Laurraine! Your new post is full of lovely things. 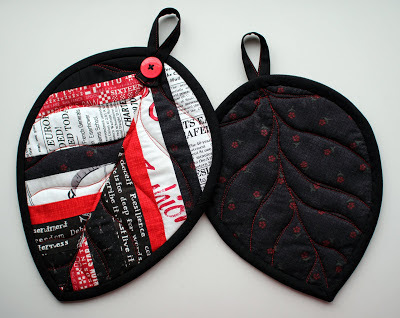 The Mug Rug with trees and Leaf Potholders... so adorable!! 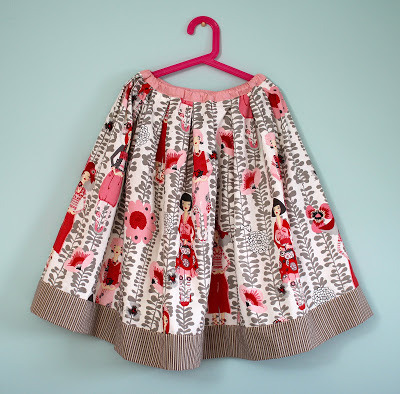 I love the black, white and red fabrics - good choice and great result :) And new skirts for your daughter... nice pattern! Those skirts are all adorable! Happy New Year! 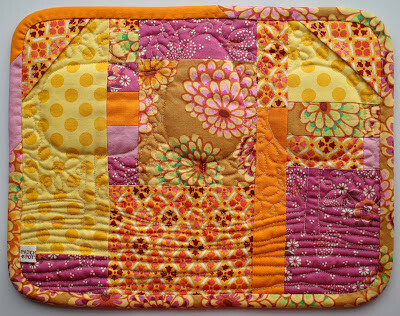 I love your mug rug... especially the fabric colours! Hope you don't mind i I pin it on my Pinterest board for future reference! Beautiful work - loved the first project best! Happy New Year! so many lovely projects! Love those skirts for C! Paul did a gorgeous hob with your scraps. Enjoy that new machine of yours and Happy New Year! Could you tell me how I can get copies of "Cotton Life" magazine? Any help would be greatly appreciated! My daughter, who's 20, and I just discovered your blog through pinterest. We are both so inspired! We love everything you do! Just love the mugrug, I love the trees and the colours....no wonder your hubby didn't want it to be gifted to someone. 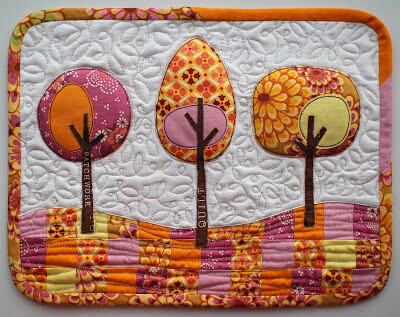 I love your mug rug - the trees are so unique and your quilting lovely. 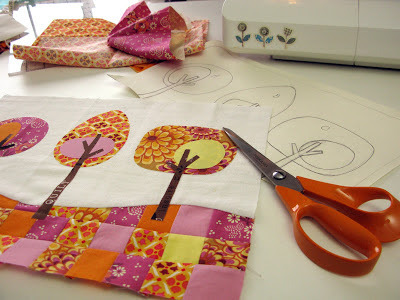 that mini tree quilt may just be the cutest thing I've seen in ages! 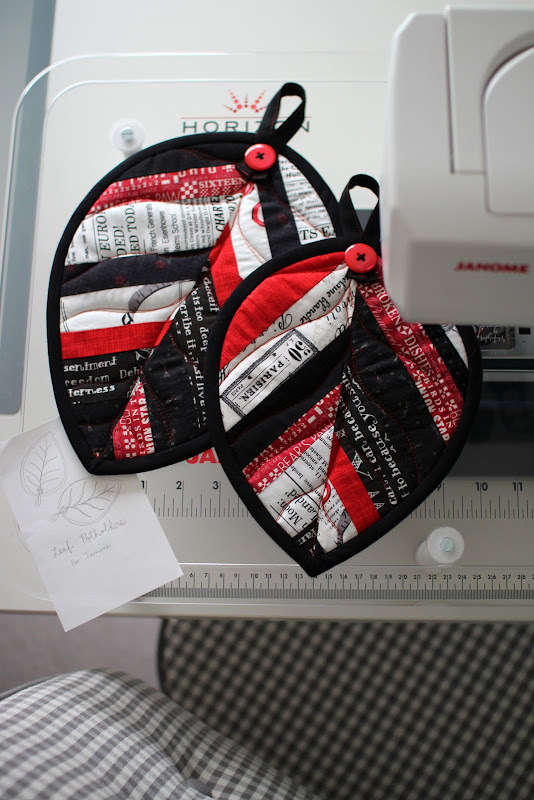 and then there's the adorable leaf shaped potholders! My first thought was: "Oh, those colours are not so typical for Laurraine"
The Mug Rug with trees and Leaf Potholders... is simply so you and so beautiful! 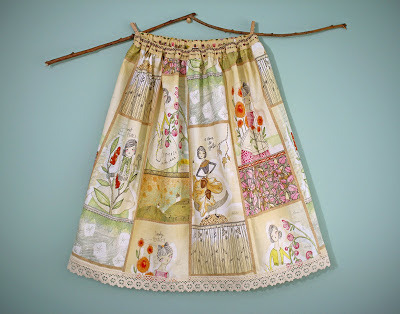 Can you tell me what the fabric is on the first skirt with the girls in blocks. That is such a precious print! Wonderful job on all the projects! 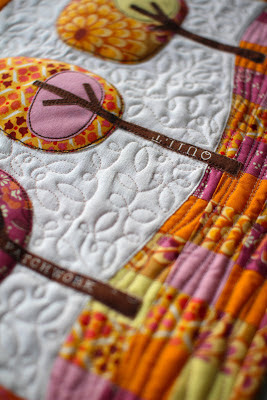 Lovely design, I'm not good in quilting and sewing things but your work is definitely gorgeous. Your MugRug is so cool. Estou te seguindo e te convido a me fazer uma visita. I just love handmade gifts and have made it my New Year's resolution to make all mine this year. I LOVE the mug rug. I am just learning to quilt and can't wait to try my hand at it. Thanks for the inspiration. What amazing, lovely things you made for the holiday! I especially love your daughter's skirts. She is so lucky to have you as her mum. I love the tree tea mug too. It's beautiful and no wonder your hubby loved it too.